Every now and then I will receive a book for review, that I know I have to start at the earliest possible convenience. At its always a pleasure when I follow my gut feeling like I did with Late Summer in the Vineyard as it was pure delight to read. I have spent a memorable half day, transported to Bordeaux, and been taught all about the wine making process, from Emmy who needs to learn to follow her instincts. Emmy is a wonderful main character, she makes a brave if not stupid decision as early as the prologue which acts as the catalyst for the rest of the book. She gets onto a work placement in France for 3 months, to learn how to sell wine, and gets into all sorts of situations. But she has a heart of gold, having seen an old woman leave her purse behind, she tracks down where the woman lives, and sets off to return it, regardless of the lady's reputation. Madame Beaumont is formidable, she runs the Clos Beaumont vineyard by herself, and keeps a low profile in her local town. However she seems to see something in Emmy and takes her under her wing, and starts to teach her about wine. With two leading men, neither of which I could really get to grips with, Emmy's family and the colleagues in France with her, there is an excellent set of characters that will keep you hooked. I lost all track of time as I found myself absorbed in the story. This is the third book I've read by Jo Thomas, and I can safely say this is my favourite, and they are becoming more and more accomplished each time, and even more compulsive to keep reading,, which is saying a lot as I still remember the feeling of wonder after reading The Oyster Catcher, her debut novel. 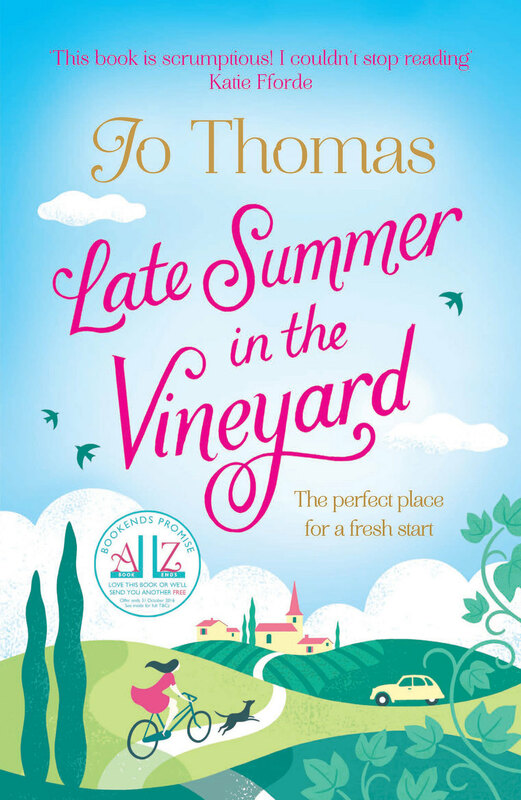 Don't let the vineyard setting put you off if you aren't particularly a wine fan, as there are all the trademark characteristics of a fabulous women's fiction novel, with romance, friendship and family all featuring highly. Late Summer in the Vineyard is a triumph, and I have no idea how my next book will compete in my affections with this! Thank you to much to Frances Gough and Bookbridgr for this review copy. This was my honest opinion.